At What Age Do Immigrants Face Higher Chances of Dropping out of High School? The chances that an immigrant child will not finish high school are associated with its age at arrival. Today's Intelligence Chart illustrates this for a group of grown men and women who reported coming to Canada before the age of 18 from countries in which English is not the dominant language. The proportion without a diploma remains more or less constant regardless of the age of arrival for those children who immigrated before reaching about 10 years of age. About 15 percent of boys in this cohort did not graduate from high school, whether they came as newborns or as nine-year-olds. This rate is no different from the overall national average for all boys. But for boys who were older than 9 years old when they immigrated, the drop-out rate steadily rises, reaching close to one-in-five for those too old to have attended primary or middle school in Canada. 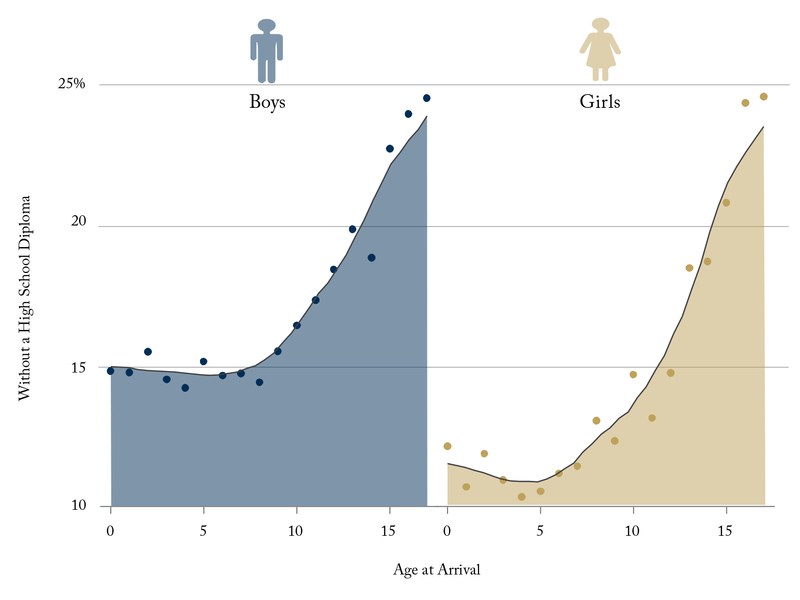 The broad patterns are similar for girls except for lower dropout rates at younger immigration ages. Click on the following hyperlink to read the Institute’s full report by Colin Busby and Miles Corak: Don’t Forget the Kids: How Immigration Policy Can Help Immigrants’ children.